During the lunch hour, we took extra break from our office to have a glimpse of the beautiful silver chariot stationed in front of the Sri Subramanya Swamy Temple in VV Puram, Bengaluru. 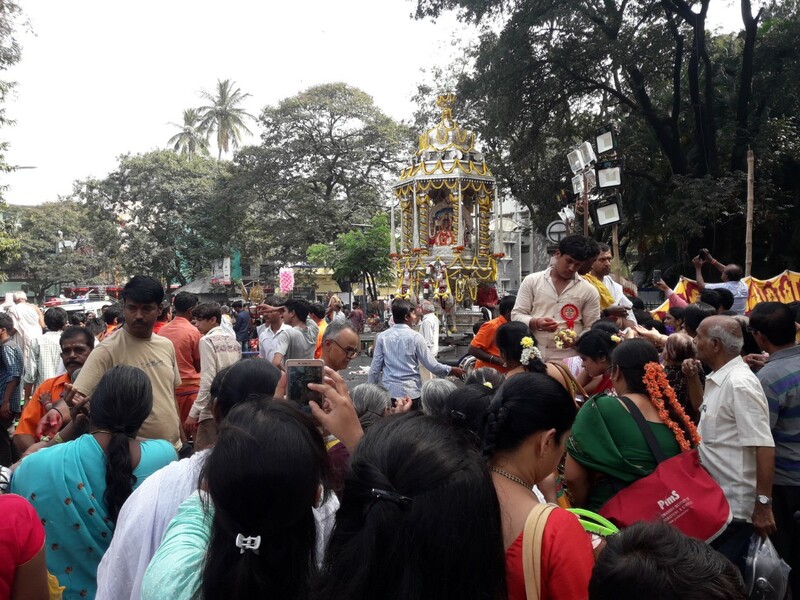 There seemed to be close to million people gathered near Sajjan Rao circle to witness the annual Silver Chariot festival. 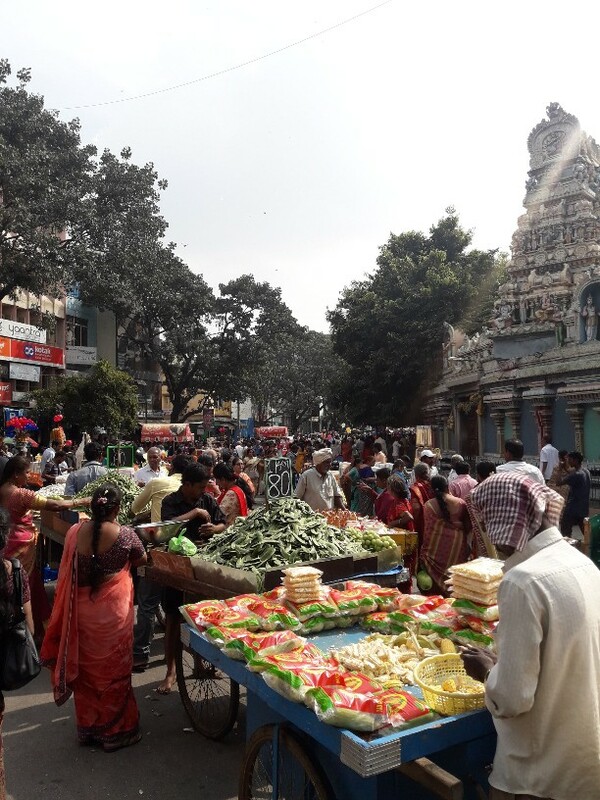 Devotees and street hawkers near Sajjan Rao Cirlce, Bengaluru. It was a Skanda Shashti or Subramanya Shashti celebration. Even in the mid-afternoon, thousands of devotees had lined up outside the Subramanya Swamy Temple premises. It was easily more than two hours of waiting to complete the rituals and come out from inside the temple. Therefore, we decided to just check out the silver chariot and return to the office. Silver Chariot, Sri Subramanya Swamy Temple, Sajjan Rao Circle. It was one of the biggest religious fair in Bengaluru. The pushcarts selling foods and other fancy items occupied the roads in front of the temples and the surrounding areas as well. The traffic department barred vehicles from nearing the Sajjan Rao circle for the day. In fact, we parked our motorcycles in the nearby residential areas and had to walk towards the temple. It was not a long walk though. We passed through VV Puram’s popular food street where several food stalls were dishing out delicious vegetarian dishes, right from chats to full-fledged meals. It was the day of broad beans (Avarekalu). You could find it in almost all the dishes that was available from the stalls in Food Street. We took couple of photographs of the silver chariot stationed near the Sri Subramanya Temple and walked towards Sri Vasavi Restaurant to eat our meal in the silver plate! I had never heard of Sri Vasavi Restaurant in VV Puram nor did we plan to come here for lunch on this day. It happened without planning. We were just looking out for a restaurant that offers good food and does not burn our pocket. There is no dearth of such an eatery in V V Puram, Bengaluru. In fact, the food street has several eateries that will leave anyone in dilemma. We entered the Vasavi restaurant in Food Street that made our dining experience one of its kind. The most important aspect of our dining here was the food on silver plate. 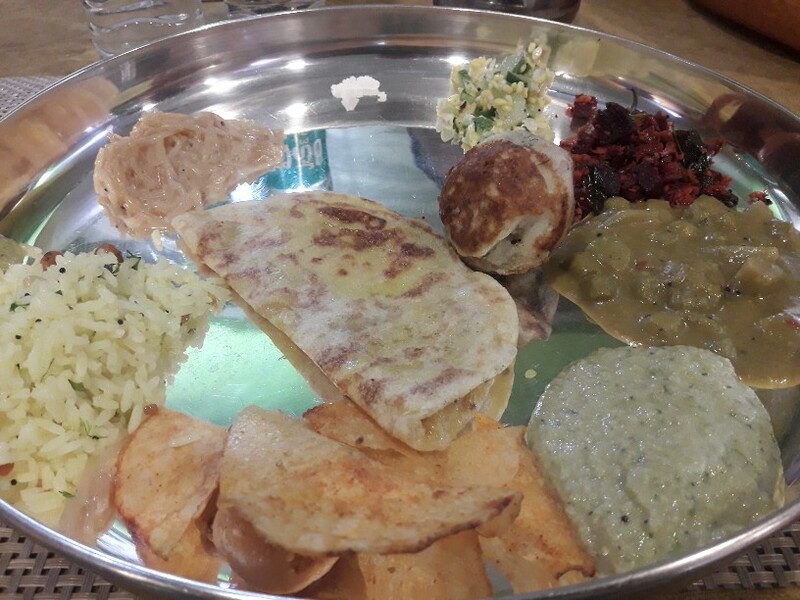 I am not sure if there are any other restaurants in Bengaluru that serves food in silver plate. South Indian meal served in Silver Plate. It was an unlimited meal at Rs. 150 per head. About 29 varieties of dishes came into our silver plates, one by one. I really do not remember all of them but I do remember those I liked the most. I have to mention here about holige, the masala dosa, the lemon rice and the thili saru that made my day. For a Karnataka style, south Indian meal experience, I would suggest anybody to try this restaurant in V V Puram. More Bengaluru photographs in our FB page.